OCLC recently published From Awareness to Funding: Voter Perceptions and Support of Public Libraries in 2018, an update to a 2008 report. The report highlights key findings from their national study of U.S. voters about their perceptions of libraries. Two areas showed noteworthy change over the past ten years: the use of libraries as a community space and commitment to library funding. 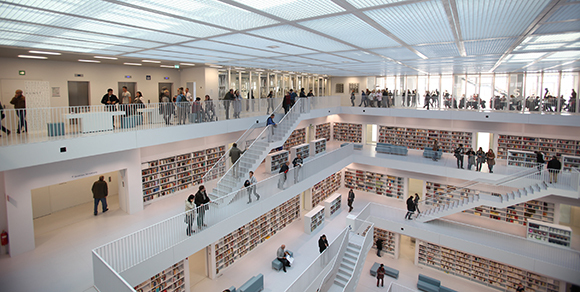 Many public libraries have been working on transforming into community hubs over the past few years, and the voters surveyed by OCLC seem to have noticed. More than 2 in 5 (44%) voters said that they value the library as a gathering place, and nearly a third (30%) view the library as a community hub. A little over 2 in 5 (43%) respondents in 2018 say that the library “offers activities and entertainment you can’t find anywhere else in the community,” compared about a third (34%) who said the same in 2008. Just under half (48%) now view this as an important role for the library, while about 2 in 5 (38%) did in 2008. Although a majority (55%) of the voters surveyed view the public library as an essential local institution, this opinion does not always translate to a willingness to vote for library funding. Only about a quarter (27%) of voters answered that they would “definitely” vote in favor of measures to support the public library, with a further third (31%) who said that they would “probably” vote in favor. While the two categories still make up a majority of voters (58%), the percentage has dropped from the three-quarters (73%) of voters in 2008 who said that they would “probably” or “definitely” vote in favor of library support measures. 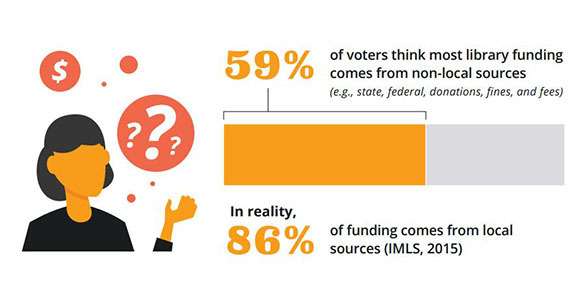 The gap between support for libraries and support for library funding may indicate a lack of understanding among voters about how libraries are funded in their communities. The full report and an infographic providing a snapshot of the report’s findings can be found here. OCLC will also host a webinar discussing their findings on April 17. 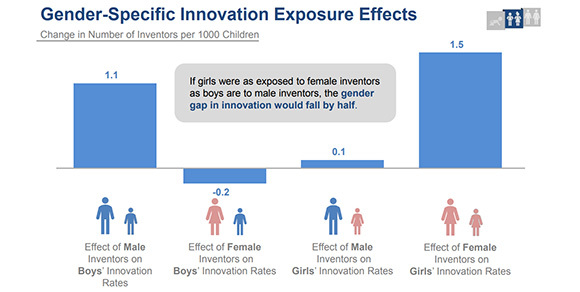 A recent paper from the Equality of Opportunity Project explores the question: “What factors induce people to become inventors?” The investigators looked into the origins of patent holders in the U.S. using tax records and school district data with test scores. Libraries, as places that encourage exploration and curiosity, have an interest in supporting innovators and entrepreneurs. And, libraries can play a role in exposing children to innovation and inventors. Many libraries have makerspaces or areas for creation, which can expose children to creative problem solving and applications of math. For example, the 2017 Library Journal best small library, Boundary County Library District, emphasizes invention. Libraries also host speakers and programs, and they could bring in local inventors and innovators, or discuss famous inventors, who reflect the identities of children in their community. Libraries can also strive to have collections that showcase inventors of many backgrounds and periodically highlight these titles. The Library of Congress has many suggested titles in their online guide to women inventors. For more information, the full report can be found here. The Schools, Health & Libraries Broadband (SHLB) Coalition recently released a report prepared by CTC Technology & Energy estimating how much it would cost to expand high-speed, fiber optic broadband internet to community anchor institutions – schools, libraries, hospitals, health care clinics, community colleges, and other public institutions that do not currently have direct fiber connections. SHLB estimates that 34 million people living in the United States do not have access to broadband internet. However, nearly all (95%) Americans live in the same zip code area as a community anchor institution (Anchor). The authors argue that using Anchors as hubs to connect their surrounding communities to high-quality internet could be a cost-effective strategy to solve the digital divide, especially in rural areas. The report provides estimates of the percentage of Anchors that are not yet connected to high-speed broadband connections. In dense metro areas, more than 4 in 5 (85%) Anchors are already connected. This is compared to only about 3 in 10 (30%) Anchors in the rural West and 2 in 5 (40%) in the Plains that are connected to high-speed broadband. Based on the models used by the authors, the total cost to connect all the unconnected Anchors in the continental United States and Hawaii would be between $13 billion and $19 billion over the next 5-7 years. The cost per Anchor varies based on the regional and environmental difficulty of connecting the fiber network. 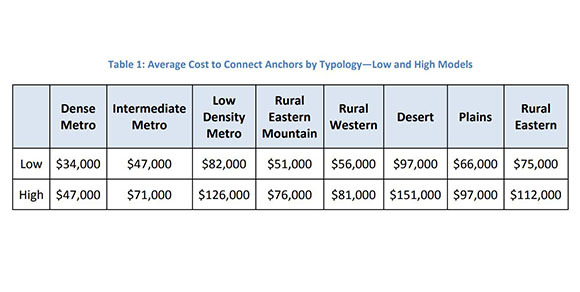 For example, connecting an Anchor in a dense metro area would cost about $34,000 while an Anchor in a rural desert area would cost about $151,000 because the builders would not be able to take advantage of existing infrastructure. While these costs seem steep, the price for connecting anchors could drop by as much as half if a major, national effort is undertaken in cooperation with regional authorities and broadband providers. Library Journal recently published the results of its Materials Survey 2018, an annual survey that gathers materials expenditure and circulation data from public libraries across the United States. Although print book circulation has dropped in the past few years, print book purchases still make up over half (54%) of public libraries’ materials budgets, while netted media (audiobooks, DVDs/Blu-rays, and streaming media) used a little under one-third (30%) of the budget and ebooks used about a tenth (9%). Within netted media spending, audiobook spending rose 16% across all of the responding libraries, including a notable rise in downloadable audio. Included for the first time on this survey, streaming media used 2% of the materials budget. Librarians noted a few shifts in the types of print books that were popular among borrowers, most notably in non-fiction. Biography/memoir is now the most-circulated genre of non-fiction, knocking cookbooks down from an 8-year streak at the top. History circulation dropped by 12% and self-help/psychology dropped 20% since last year’s survey. In print fiction, mysteries remained the most popular while romance and Christian fiction circulation slipped down 12% and 14%, respectively. 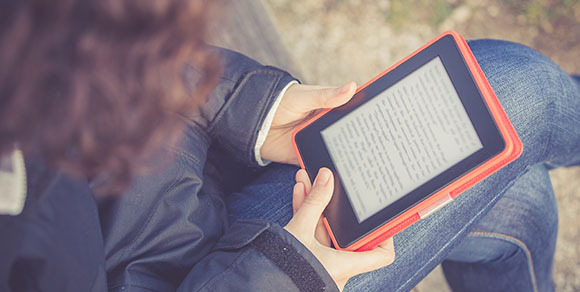 About 3 in 5 (58%) respondents reported that ebook circulation increased at their library in the past year, although patrons tend to read different genres than they do in print. Like in print fiction, mystery and general fiction are the most circulated genres. However, they aren’t quite as popular as they are in print, and ebook circulation dropped in 2017. Meanwhile, romance ebook circulation rose by 8% and sci-fi/fantasy circulation increased by 18%. Like print nonfiction, biography/memoir is the most popular ebook genre. Politics/current events rocketed up to second place from a distant fourth last year, compared to being in sixth place among print circulation. History, in fifth place for print circulation, took third place in ebook circulation. UNICEF recently released The State of the World’s Children 2017: Children in a Digital World. This report examines the impact that digital technology has had on the lives of children all over the world. Young people are the most digitally connected age group worldwide. Seven in 10 (71%) young people use the internet, compared to a little less than half (48%) of the total population. However, this leaves out about 346 million young people – more than the total population of the United States – who are not using the internet or other digital tools. The children left out of digital connectivity are often those who could benefit most, creating a digital divide that could deepen existing socioeconomic divisions if it is not closed. As part of the research for this report, UNICEF used the social messaging tool U-Report to survey young people (ages 13-24) about their internet use. They got 63,000 responses from youth living in 24 countries. About 2 in 5 respondents (42%) said that they taught themselves how to use the internet, while a similar number (39%) reported that they learned from friends or siblings. 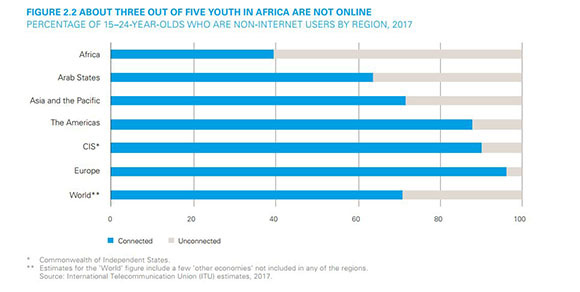 Young people from low-income countries are 2.5 times more likely than their wealthier counterparts to say that they need more access to digital devices to improve their lives online. When young people were asked what they like most about using the internet, 2 in 5 (40%) said they like using it learn things for school and about a quarter (24%) like using it to learn skills that they can’t learn in school. When asked what they dislike about the internet, about a quarter (23%) mentioned violent content and a third (33%) dislike seeing unwanted sexual content. About 1 in 10 (8%) said that there is nothing they dislike about the internet, an answer that was more popular in low-income countries. For more information about children growing up in a digital world, the full report can be found here. Every year, the Library Research Service conducts the School Library Survey to understand the state of school libraries in Colorado. This year there was a 29% response rate. Out of the 315 libraries that completed the survey, 56% have a certified teacher librarian or media specialist on staff. Between 2015-2016 and 2016-2017, the median number of e-books increased and physical books decreased for elementary, middle, and high school library collections. For elementary and middle schools, the median number of computers also increased. Most of the other statistics in the survey remained consistent between 2015-2016 and 2016-2017. School libraries staffed by a certified teacher librarian continue to show high rates of engagement with the larger school community, with 95% of librarians participating in school committees and 91% meeting regularly with their principal. 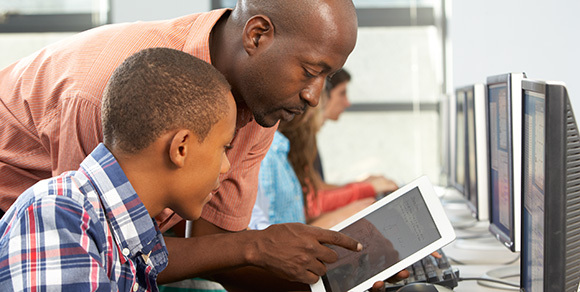 At least once a week, the majority of school librarians help students use digital resources, use a variety of sources, use technology to organize information, apply critical thinking skills, and evaluate the credibility of sources. Librarians have special training in these skills and how to work with students and teachers. The School Library Survey is undergoing a major revision with the goal of being as useful as possible for school library staff. This year’s survey will open on April 1, 2018. If you participated in the survey for 2016-2017, you can access your school’s library profile here. To see more results from the 2016-17 Colorado School Library Survey, view the 2016-2017 Annual Colorado School Library Survey Highlights Fact Facts. The National Center for Education Statistics recently released a first look at the results of the 2016 Progress in International Reading Literacy Study (PIRLS) and the new ePIRLS. This assessment is administered every five years to fourth-graders in participating countries around the world. PIRLS assesses student performance in reading literacy, while ePIRLS, administered for the first time in 2016, measures students’ approaches to informational reading in an online environment. The overall PIRLS average reading score for fourth-graders in the United States was 549 out 1000 possible points, ranking 15th out of the 58 countries participating. The U.S. average score declined from the last time PIRLS was administered in 2011 (556), but remained higher than the international centerpoint (500). About 1 in 5 (16%) U.S. fourth-graders hit the “advanced” benchmark (a score of 625 or higher) on the PIRLS scale, and over half (53%) scored at or above the “high” benchmark (550). Female students in the U.S. scored higher on average than males (553 vs. 545). Students attending public schools with more than 75% of students eligible for free or reduced-price lunch scored lower on average (516) than the U.S. overall average reading score. Sixteen countries participated in the first ePIRLS assessment. Fourth-graders in the U.S. ranked 6th out of the participating school systems, with an average score of 557 out of 1000 on the online informational reading scale. Student scores were distributed similarly to the original PIRLS assessment – about 1 in 5 (18%) U.S. fourth-graders hit the “advanced” benchmark, and over half (56%) hit the “high” benchmark. Like with PIRLS, female students in the U.S. scored higher on average than male students (560 vs. 554), while students at schools with more students qualifying for free or reduced-price lunches scored lower than average (527). A study recently published in Applied Developmental Science measured the connection between children’s home environments before kindergarten and children’s academic skills during their 5th grade year. The study found that “early home learning environments related to children’s academic skills up to 10 years later across all subgroups studied–White, Black, Hispanic, English-speaking, Hispanic Spanish-speaking” (13). Children’s early learning environments predicted their academic skills the summer before they began kindergarten, and their academic skills at that time predicted their academic skills in 5th grade (12). The researchers concluded that “experiences parents provide their infants as early as the first year of life may solidify into patterns of engagement that will either continue to support or impede children’s emerging skills over time” (12). The study included 2,204 mothers and their children from low-income and ethnically diverse backgrounds. Children’s home environments and their academic skills were assessed the summer before they began kindergarten and again during 5th grade. Home learning environments were measured based on “children’s participation in learning activities, the quality of mothers’ engagement with children, and the availability of learning materials in the home across children’s first five years of life” (3). Children’s academic skills were measured using assessments of their vocabulary, literacy skills, math skills, and cognitive ability. In their analysis, the researchers controlled for other characteristics of families, like the mother’s education background, gender and firstborn status of the child in the study, race/ethnicity of the family, mother’s employment status, and if there was father figure living in the home. Libraries are well-positioned to work with families in those critical years before their child enters kindergarten. 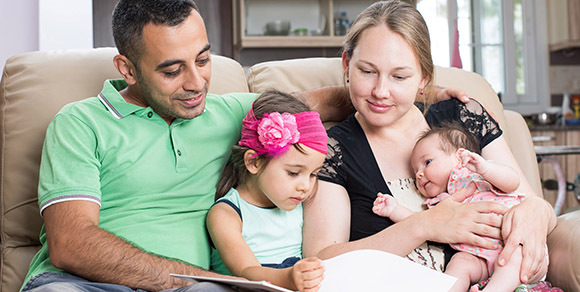 Libraries can support positive early home learning environments by sharing ideas for learning activities, modeling and supporting positive caregiver-child interactions, and providing free learning materials. For more information, the full article can be found here. The Andrew W. Mellon Foundation recently released the results of a study examining diversity in academic libraries. Ithaka S+R was commissioned to survey member institutions of the Association of Research Libraries (ARL) to find out how the academic library community perceives its progress towards more inclusive and diverse libraries. Across the ARL libraries surveyed, about 3 in 5 (61%) library staff are women and 2 in 5 are men (38%). These gender ratios remain consistent across levels of management and seniority, but begin to vary among different positions within the library. More than 4 in 5 (84%) library communications positions are filled by women. Finance/development, human resources, and information literacy/teaching topped out the female-skewed positions (between 72%-82% female). Positions primarily staffed by men include security (73% men), technology (70%), maker space/design lab (65%), and facilities/operations (64%). When directors of the participating institutions were asked how their library compared to others in terms of gender equality, they considered their own library to be less inclusive than the larger academic library community. In addition to being a largely female profession, 7 in 10 (71%) academic library staff members are white non-Hispanic. Unlike gender, ethnicity varies across management and seniority levels – nearly 9 in 10 (87%) senior staff are white non-Hispanic. Academic library directors considered their own library to be more equitable in terms of race and ethnicity compared to the library community, but felt that their libraries were less racially diverse than the library community. The directors surveyed mostly attributed the lack of diversity to external factors that might be limiting the number of job applicants from diverse backgrounds rather than internal factors like bias in the interview process or an inclusive library culture. For more information about diversity in academic libraries, the full report can be found here.